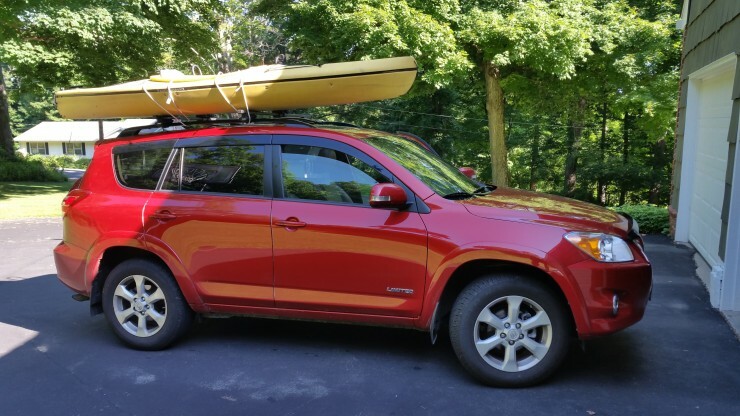 Loaded up the car and headed to the local bass pond for an early morning kayak fishing trip. Wanted to start the holiday weekend off right. Most of the nearby trout water is running a bit high, so this was a good alternative. 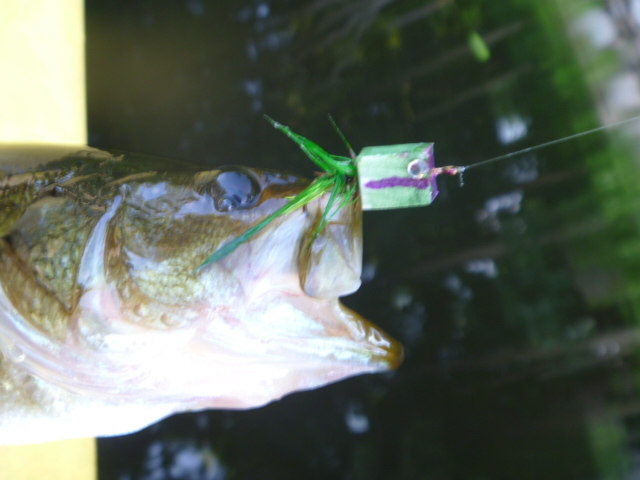 Fishing was slow for the first hour, but when I tied on a yellow Booglebug, things changed for the better. 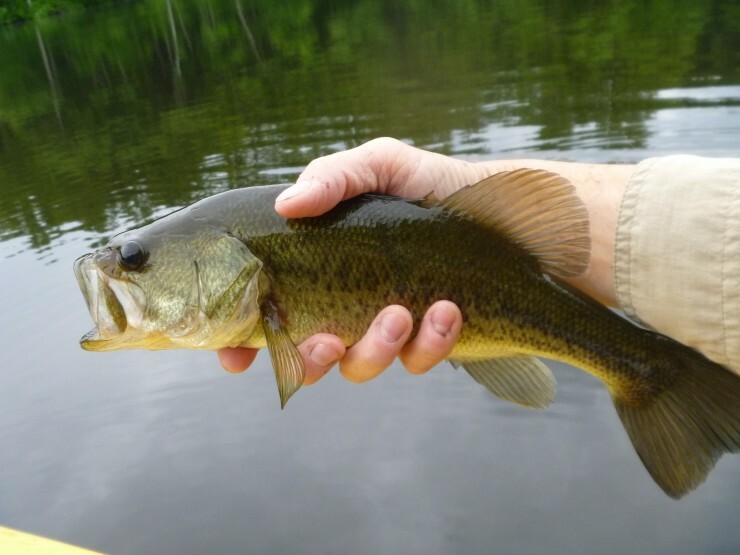 I picked up this bass, along with crappie and bream. Hope some of your weekend fireworks will be on the water. Enjoy! 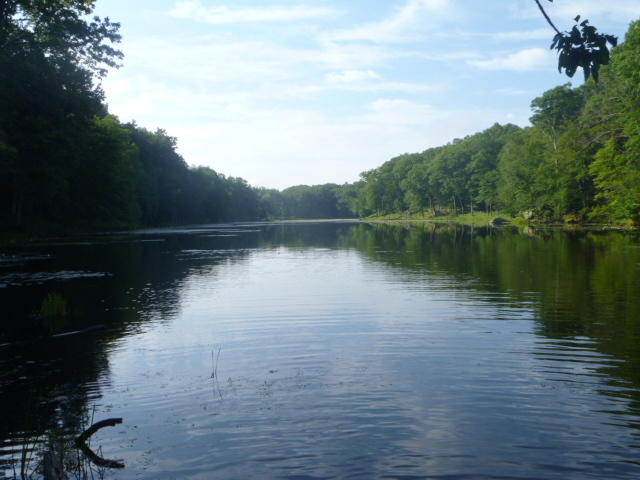 Most of us look for some type of marker to identify a great fishing spot. In the age of Google Maps, cellphone cameras and GPS, little is left uncharted. Yet we still commonly refer to these places by landmarks. Sometimes it’s a boulder; other times a tree, bend in the river, or pull-off down a dirt road. We keep them to ourselves or share with friends at the end of the day. 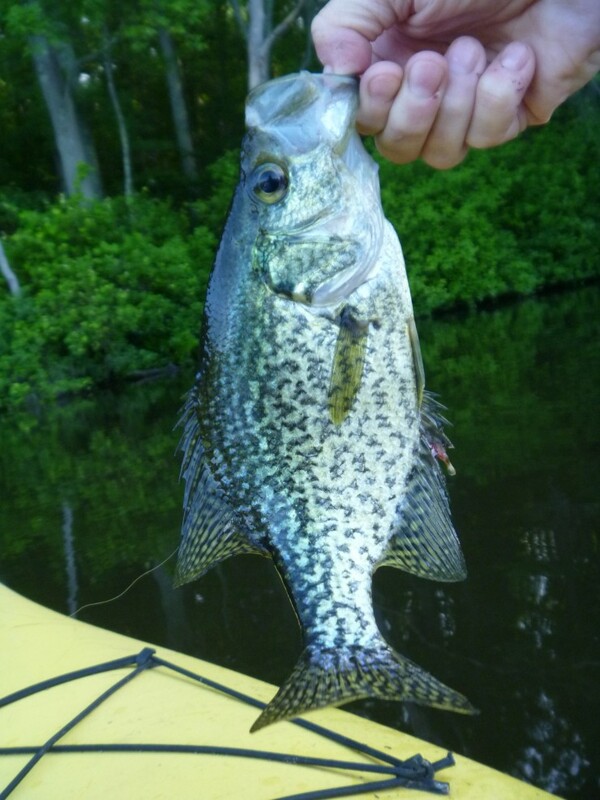 Today I took the kayak to a local pond for some morning fishing. 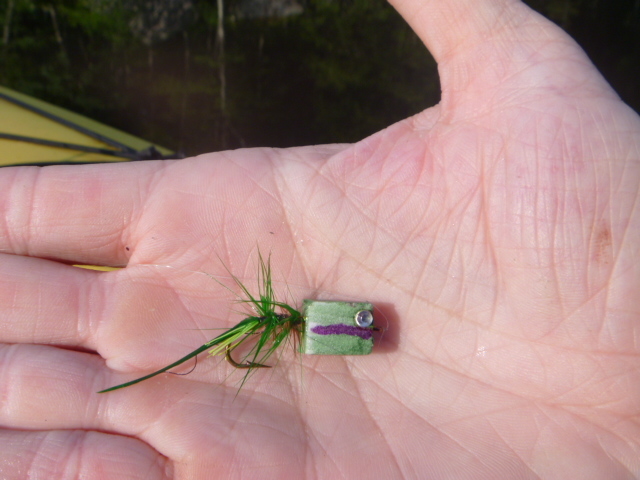 I paddled slowly along the shoreline, tossing poppers and picking up bream every few yards. 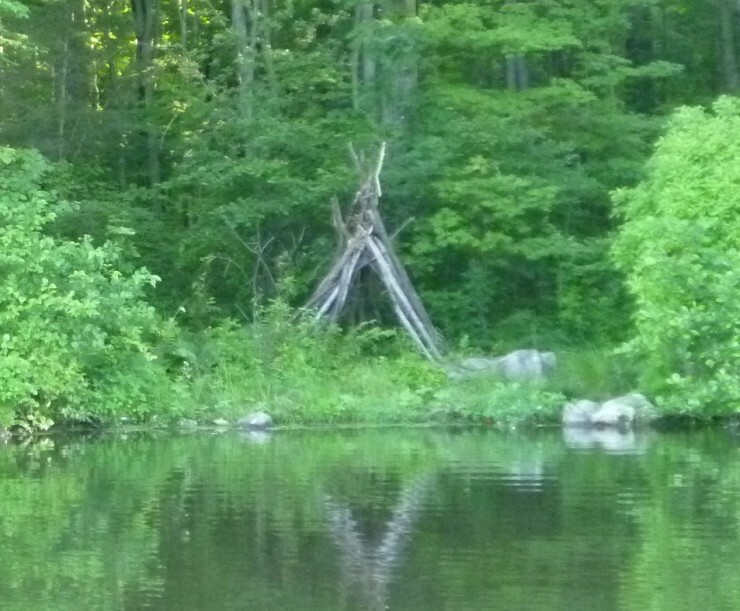 I decided to take a break and stopped to make a photo of a crude teepee frame. I’m guessing this is the work of local teenagers and not the Potatuck Indians. 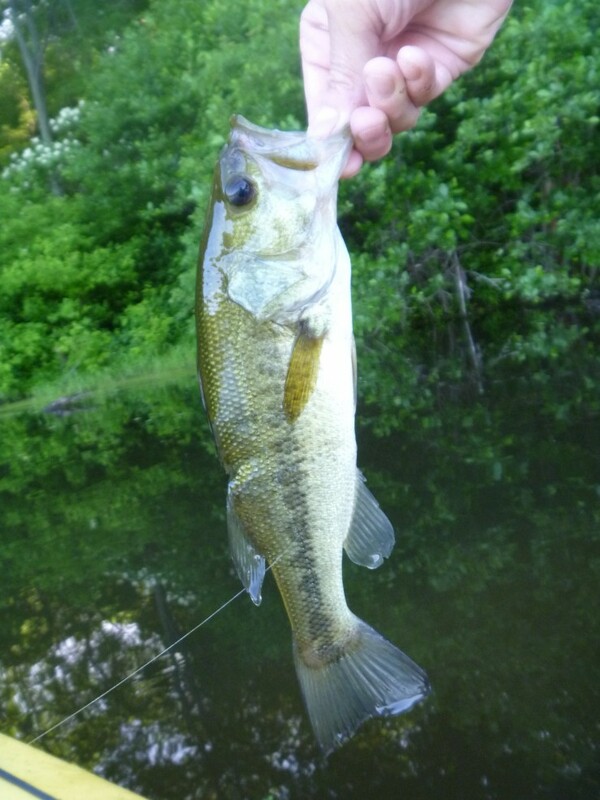 After checking my gear, I cast a few times and within minutes landed two nice bass. Normally I would’ve been satisfied and moved on, but I spotted a small notch that looked really fishy. 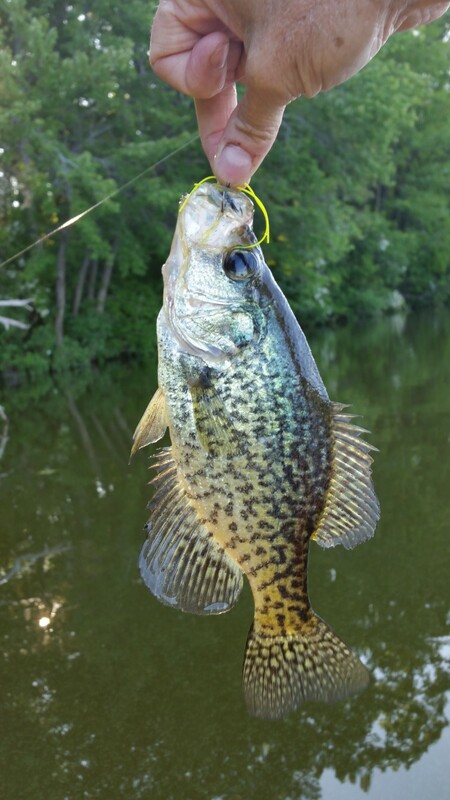 Casting one more time I picked up a nice black crappie, my first of the year. They’re always a welcome surprise. Summer Solstice, aka the longest day of the year, is this weekend, giving you plenty of daylight to get out on the water. Hope you find some new landmarks. Enjoy! Most of us remember the UPS ad campaign “What can brown do for you?”. 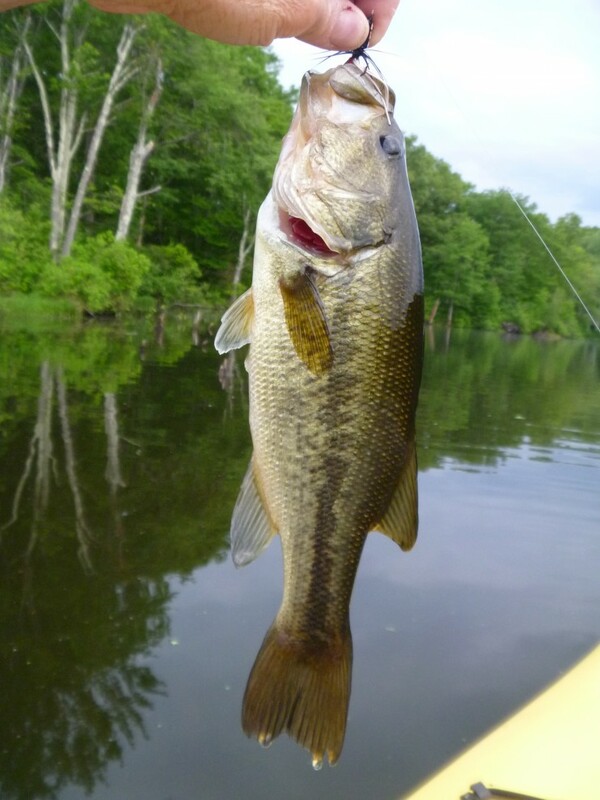 This morning brown was the popper color of choice, as I caught quite a few bream and bass at the local pond. It was a good day, with overcast skies and temps in the 60’s. 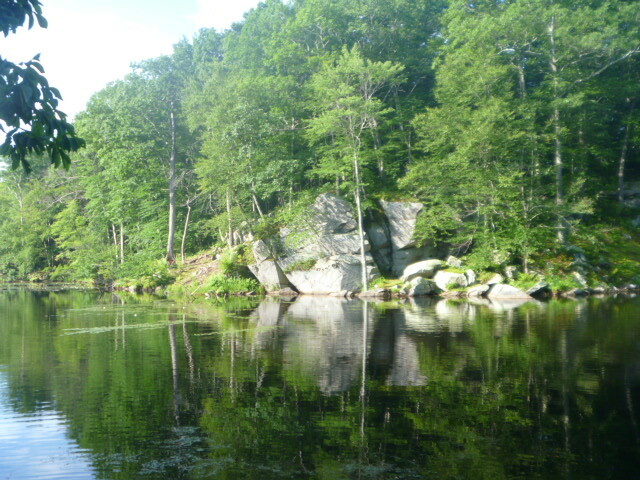 This particular body of water has hardly any lilies, but plenty of grass and fallen trees along the shoreline. 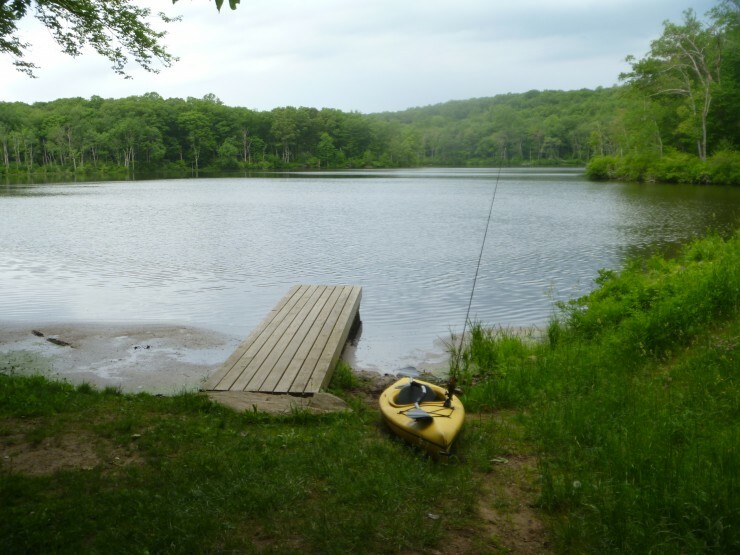 The morning started with a few small bass, and then a string of bream and sunfish. 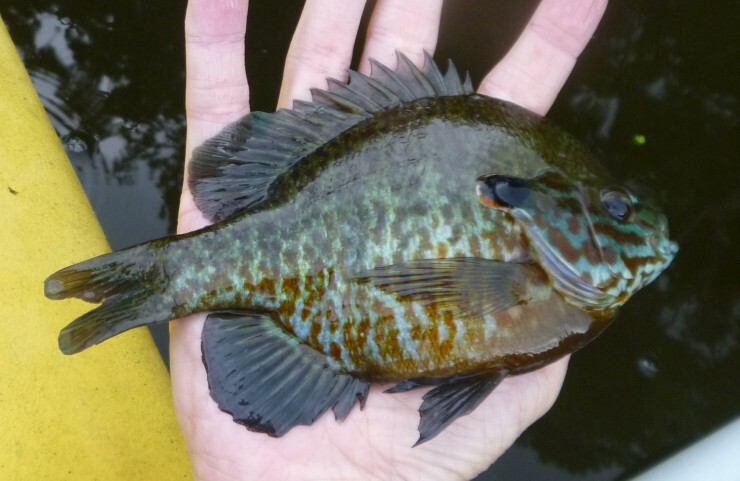 This was one of the largest and most colorful sunfish of the day. 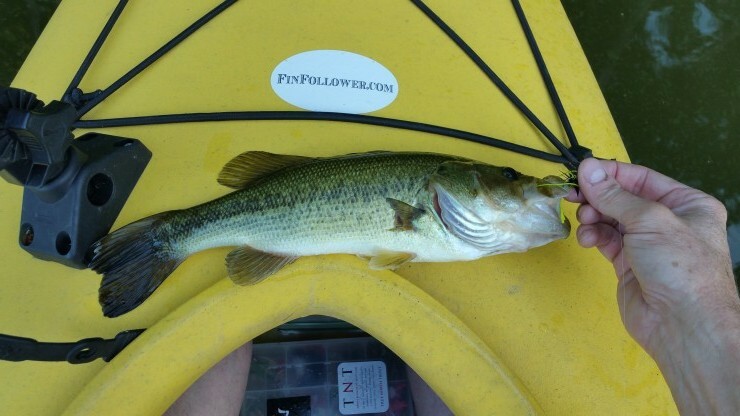 Then my luck changed, and this healthy pickle began to pull the kayak into deeper water. For a few moments, it felt like a kayak sleigh ride. All in all, it was a fun and productive couple of hours. The only downside was the condition of the popper at the end of the trip. The pic below shows a new one just above the one I used. Fishing in the northeast has been fantastic these past few weeks. Hope you have a chance to catch some too. Enjoy! 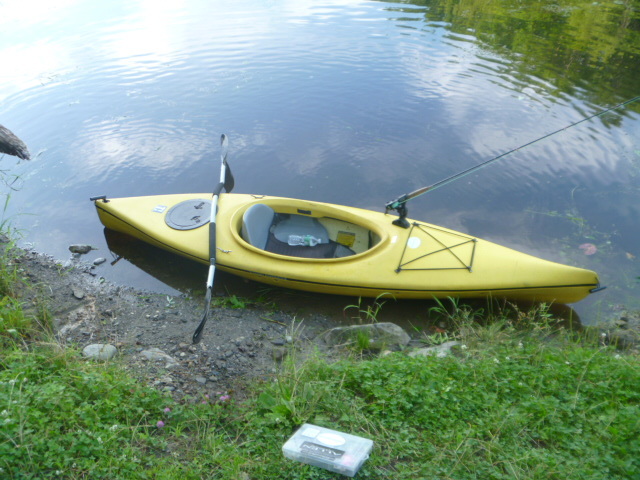 With the local weather forecast looking less than certain, I decided to make an early morning run to a local pond for some kayak fishing. I was on the water by 6 am, and had the place to myself for 2 hours. While many ponds in the area have already become choked with lilies, this one is mostly clear, with algae and grass forming only in the corners and small pockets. 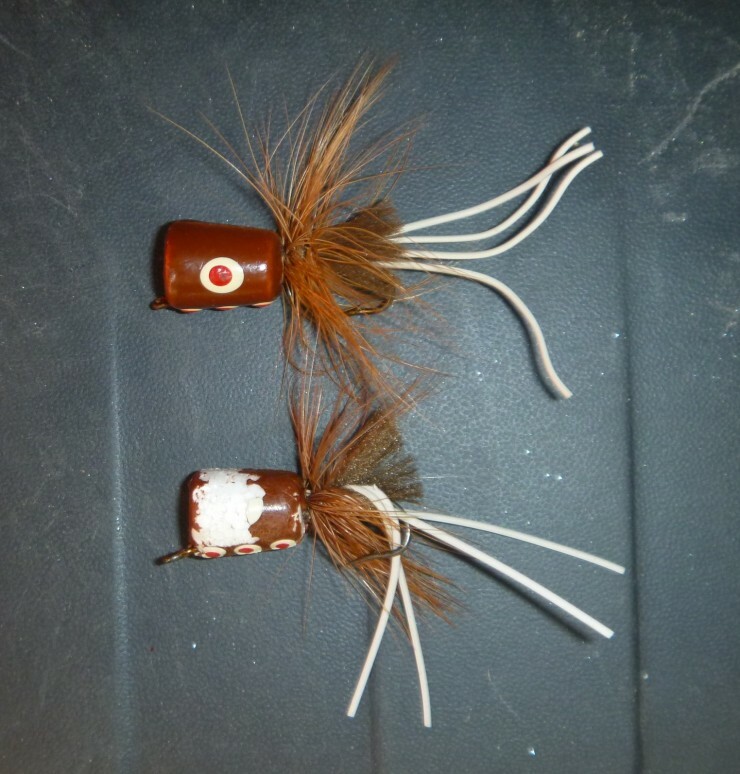 Frequently I would hear the sound of large bass cruising the shoreline and making violent strikes against the panfish. It felt like a scene from the Discovery Channel. I didn’t catch anything until I started using smaller poppers. 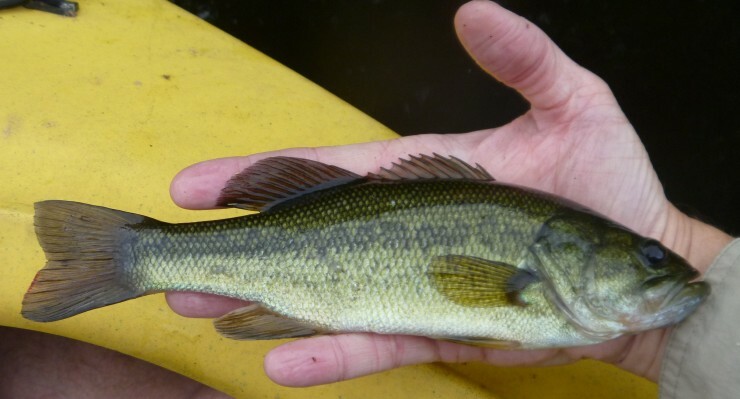 Then I picked up a few bass that looked like this. 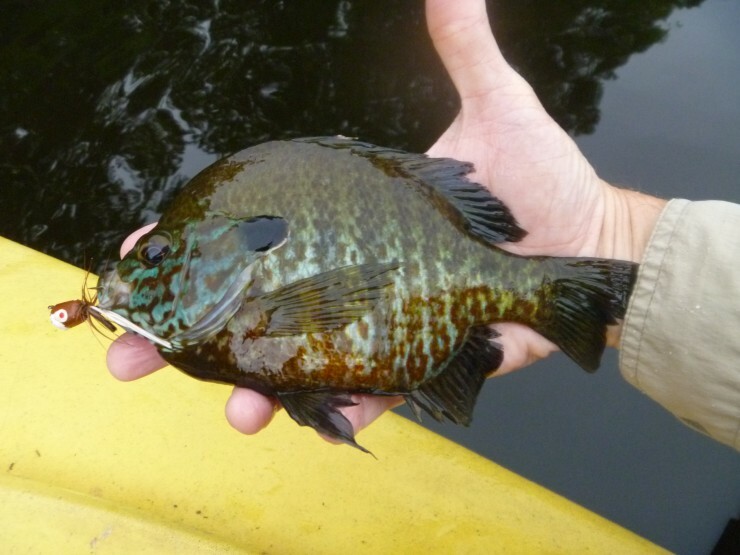 I also brought in a number of sunfish. This wasn’t the largest, but the colors were amazing. As the showers started, I paddled to shore and loaded up my gear. Within a half hour, I was unpacked and back at home, deciding on what to have for breakfast. When the weather or your schedule doesn’t allow time for a long trip, take advantage of local water. Some of these short jaunts have been the best this year. Enjoy!